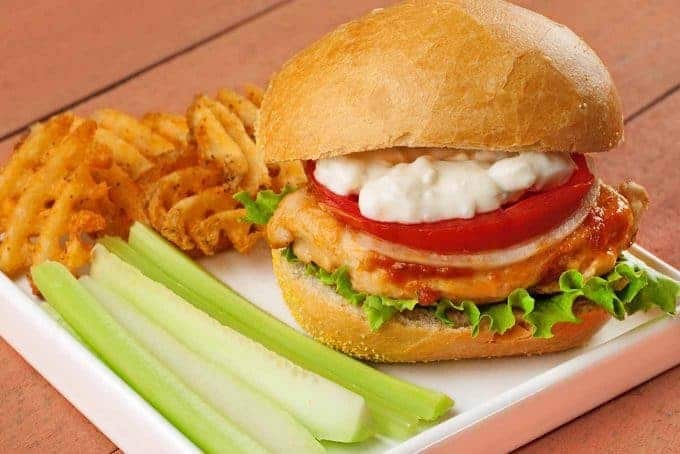 These easy chicken sandwiches, topped with a blue cheese sauce, capture all the essential flavors of buffalo wings. 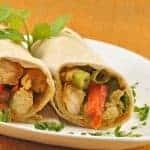 The chicken breasts are braised in a combination of butter and hot sauce, so they turn out exceptionally tender and moist, and the braising sauce can be made mild enough to suit those who aren’t loving a lot of heat. Just put the hot sauce on the table for anyone who likes some extra kick. 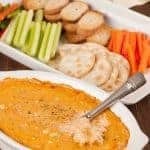 Make the blue cheese sauce by combining the mayonnaise, buttermilk (or milk/sour cream combo), blue cheese, garlic and a few grinds of black pepper in a small bowl. Set aside until ready to serve. Place the chicken breasts between 2 sheets of plastic wrap and pound to a uniform thickness of about 1/2-inch. Cut into 4 equal portions. Combine the flour and salt in a shallow dish and dredge the chicken, shaking off the excess. Heat 2 tablespoons of the butter in a skillet over medium high heat. Add the chicken and cook until light golden in color, 2 minutes per side. Transfer to a plate and whisk the hot sauce (start with a small amount – you can always add more) and chicken broth into the butter and pan juices. Combine well and reduce the heat to low. Return the chicken to the pan, cover and cook for 15 minutes, turning several times to coat the chicken with the hot sauce mixture. 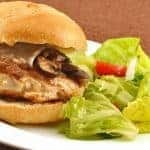 To assemble the sandwiches, place some lettuce on the bottom of a roll, top with chicken, onion, tomato and blue cheese dressing. 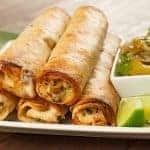 Serve with celery sticks and cucumber spears. Oh my gosh I want this for lunch right now!